Note: I am taking the day off so I am posting a "rewind" of a post from 2008. I just wrote on Monday about my skin condition, Keratosis Pilaris, returning. It is a condition that causes what looks like red goosebumps on the skin. I have it on my upper arms. Using body scrubs on the affected area, rubbing, and applying harsh products will aggravate the condition. This recipe used to help in past years. Right now, nothing seems to be working -- I've tried everything from the overpriced DermaDoctor KP Duty to LacHydrin to prescriptions. I started in again with the latest version of Paula's Choice 2% BHA Lotion. This no longer contains parabens, as it did years ago when I used to use it. It will take a few weeks to show any changes, so I am hoping it will work. I wish the 100% natural recipe or pure coconut oil worked for me this season. Just because it is not currently working for me, doesn't mean it won't help you! This post originally appeared two years ago. Today we're going to make a simple facial mask. This isn't a paste or a hardening clay mask. It's going to be a bit messy, but the results will be worth it! 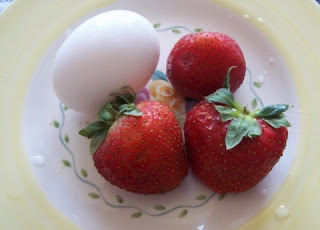 Strawberries are one of my favorite fruits to use in skin care. Not only does the fruit of the berry contain more vitamin C than oranges, the leaves alone contain 4 times as much vitamin C! Strawberries also contain salicylic acid, also know as beta hydroxy acid, which is oil-soluble, meaning it can penetrate into the pores and help "de-gunk". I have found 2 completely natural treatments for my own KP. Your results may vary. I use coconut oil (virgin 76 degree) every single night on my arms faithfully. Coconut oil has been used for many years to naturally treat various skin conditions, and it truly has helped my Keratosis Pilaris. 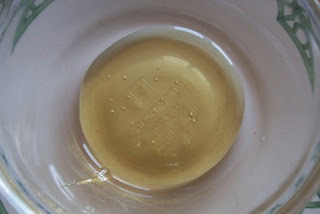 With the coconut oil, I also used the recipe I am going to share with you today. The salicylic acid from the berries helps, in my case, to treat the Keratosis Pilaris naturally. Again, I am not a doctor and your results may not be the same as mine. I use this messy mask often. 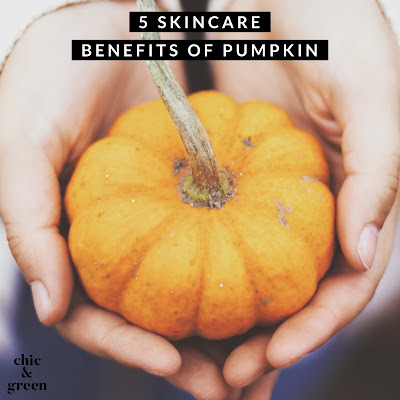 I have battled Keratosis Pilaris (those pesky little red bumps on the backs of the arms for me...on arms, legs and other areas for many as well) for more than 10 years. KP is caused by the skin producing too much keratin, which ten traps the hair follciles in the pores. Even though KP is a harmless condition, I know from my own experience that it can cause self esteem issues. Before I had my KP under control I wouldn't wear sleeveless shirts. Sometimes I would be asked, "Did you know you have a rash on the back of your arms?" I went to my dermatologist years back who told me to apply Am Lactin or Lac Hydrin. Neither worked well and smelled heavily of ammonia. She advised me to avoid mechanical scrubs, as they would only further aggravate the problem and cause scratching and bleeding. This was very true in my case. Once I stopped trying to scrub away a skin problem that cannot be scrubbed away, the redness did tame a bit. I found great help in Paula Begoun's 2% BHA and her AHA products. When used together faithfully, my keratosis pilaris diminished by about 80% in a couple of months. While I am thankful to have found relief, I am not crazy about the ingredients in either product. Both contain potentially irritating ingredients and parabens and are full of silicones. *See note about changes to the Paula's Choice formula up in my 1st paragraph. 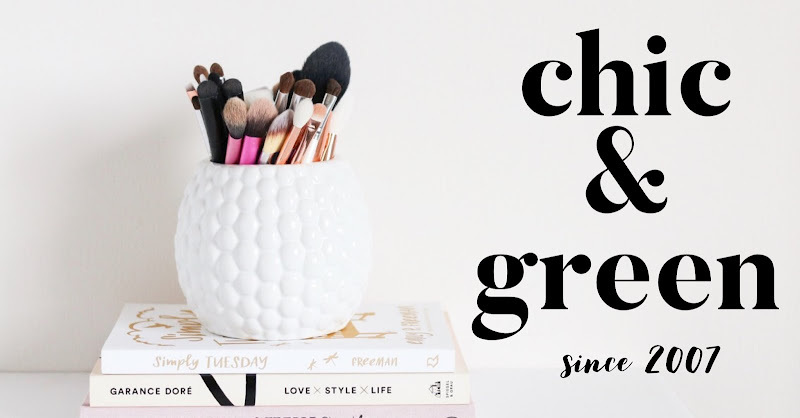 Stopping my Paula's Choice regimen was hard because that meant I had to find other avenues of treating a skin condition that never really is cured if you stop treating it. So let's make my messy berry mask! Please note that it is a very thin and frothy mixture. Many recipes are more like a paste because they contain cornstarch or baking soda. I find that neither are necessary and can be a bit harsh on your skin. Even though it's a bit messy, it is very effective! Step 1: Put your honey in a bowl. 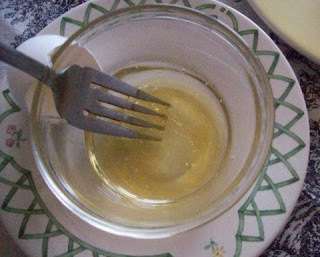 Add the egg white and mix it with the honey. Step 2: Mash strawberries with a fork or chop in your food processor. I also add the leaves for added vitamin C. Mixture will appear slightly frothy. 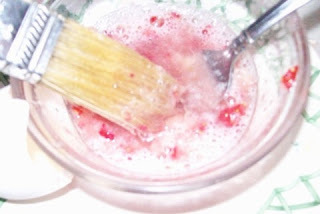 Step 3: Since this is so messy, I brush the mixture on to my skin. Leave on 15 minutes and rinse with warm water. The mask works especially well on oily skin. I use it on my face a couple of times a week in the summer when my skin is more on the oily side. As I said earlier, I use this faithfully several times a week on my KP and use it in conjunction with coconut oil. I never scrub the area, and I follow with a fragrance-free goat's milk lotion, because I find that the natural lactic acid in the milk also helps! You need to keep up with this on a regular basis, as Keratosis Pilaris is a chronic condition.